Those working with tribology often have a background in mechanical engineering, while people working with lubricant development have a chemistry/chemical engineering background. This means they have a tradition of approaching problems in different ways. Today’s product development puts higher demands on timing and quality, requiring collaboration between people with different backgrounds. However, they can lack understanding of each other’s challenges as well as a common language, and so this book aims to bridge the gap between these two areas. 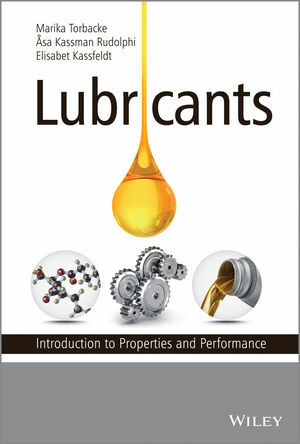 Lubricants: Introduction to Properties and Performance is a comprehensive reference for industry practitioners (tribologists, lubricant technicians, and lubricant chemists, etc) and is also an excellent source of information for graduate and undergraduate students. Marika Torbacke has a PhD in chemical engineering and has held a position as an adjunct Professor at Luleå University of Technology in Tribochemistry for six years. She has been the development manager for automotive lubricants at Statoil Lubricants and the company representative in ATIEL. She has also worked with development of industrial lubricants with a focus on environmentally adapted lubricants. Apart from her extensive experience of lubricant development work, she has been lecturing and teaching in the areas of lubricants with a focus on environmentally adapted lubricants, elastomer compatibility and soft metal corrosion. Åsa Kassman Rudolphi is an Associate Professor in Materials Science at Uppsala University. Her field of research is tribology and surface engineering, with focus on materials science aspects. The work includes design and interpretation of experimental studies, surface imaging and analysis for friction and mechanism studies, and evaluation of new material solutions for different applications. She has a long experience of collaboration with industrial partners and industrial applications. She is also frequently teaching and developing courses in the areas of materials engineering and materials characterization. Elisabet Kassfeldt is a Professor in Machine Elements at Luleå University of Technology. Her field of research covers lubricant properties and performance, including testing and evaluating both lubricated single components and full mechanical systems and industrial applications. Performance of environmentally adapted lubricants is a special area of interest. She has done extensive research work in this field, often in cooperation with industrial partners. In addition, she has a wide experience of teaching in Mechanical Engineering, including courses in machine design, hydraulics and tribology.